But you’ll have to pay to play. Bigly. 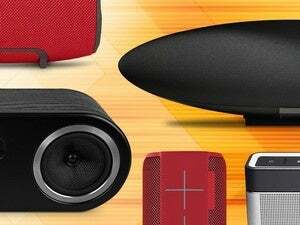 Soundcast was building great wireless speakers while the powers behind Bluetooth were struggling to find a use for the technology. 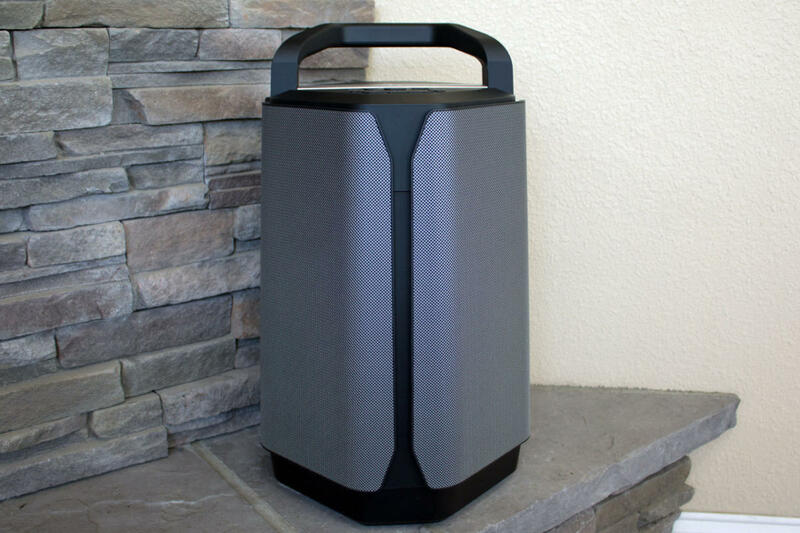 In the nearly 10 years since I reviewed the company’s Outcast, I haven’t found a better powered, portable outdoor speaker. The Soundcast VG7 comes very close. The VG7 does, of course, rely on Bluetooth—with support for the aptX codec and NFC for quick and easy pairing to boot. The Outcast came with an external iPod dock that had Soundcast’s proprietary wireless technology built in. The dock also had a 3.5mm analog audio input that I’ve always plugged a Sonos Connect into—effectively converting the Outcast into the outdoor Sonos speaker Sonos stubbornly refuses to build. But enough about the Outcast, let’s talk about the VG7. The 18.9-inch-tall cabinet is built like a tank—weighing in at a beefy 21 pounds. A thick and sturdy basket-style handle on top makes it easy to lug around. A pair of 15-watt Class D stereo amplifiers drives four 3-inch full-range drivers, while a third 30-watt Class D amp powers a down-firing 7-inch long-throw woofer. The full-range drivers feature aluminum cones, and the woofer is fabricated from injection-molded polypropylene. Both materials are valued for their stiffness and resistance to the type of resonance that can color the sound produced by some other types of speakers. There’s a 3-inch full-range driver on each of the VG7’s four sides, and a 7-inch down-firing woofer in its base. The woofer fires into a dome-like structure at the base of the speaker so that the speaker’s low frequencies radiate all around (aided by four ports near the base). The full-range speakers fire out in all four directions to create a not-quite-stereo 360-degree soundstage. But the VG7 also supports Qualcomm’s TrueWireless Stereo, so if you buy two of them, you can get genuine left/right channels. With the VG7 priced at $800, that’s an expensive proposition to be sure. But it can be done. What can’t be done is to include the VG7 in multi-room DTS Play-Fi setup. That honor is being reserved for the VG7’s bigger brother, the not-yet-available VG10. Most of the time, you’ll control the VG7 from your smartphone or tablet. But there are also volume, mute, and transport-control (play/pause and track forward/back) buttons on top of the speaker. An indoor/outdoor EQ button taps an onboard 24-bit DSP that—to my ears, anyway—mostly just boosted bass response (the music note in the Soundcast logo lights up when the outdoor EQ is active). If you don’t want to tie up your smart device, you can plug an analog audio source into the VG7’s 3.5mm input. 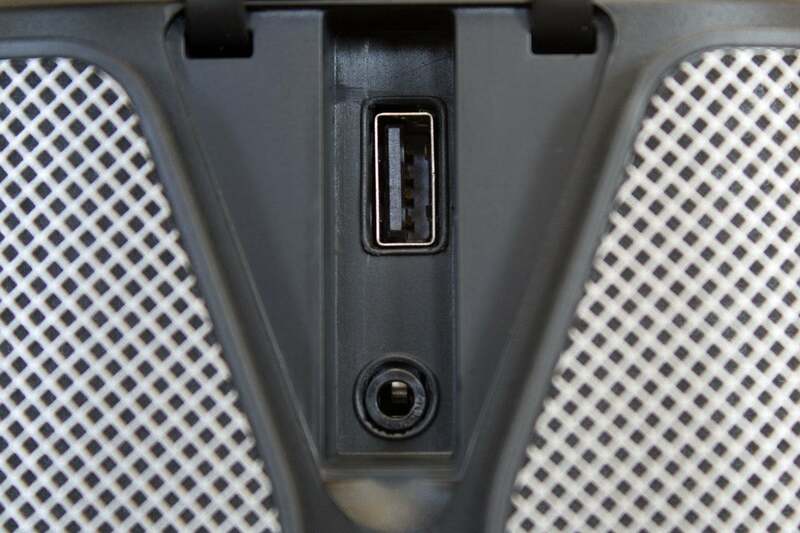 Pull the rubber cover off this port and you’ll also find a convenient USB 2.0 charging port for your phone or tablet. That cover, and the one over the power input jack, have retainers so you don’t need to worry about misplacing them. An inline power brick with a generous 10.5 feet of cord can charge the VG7 regardless of whether it’s playing music. With the plug covers in place, Soundcast says the VG7 earns an IP64 rating. That means the speaker is completely dust-proof (6) and protected from splashing water (4). In other words, you don’t need to worry about leaving it next to the pool or taking it to the beach, but don’t get any ideas about hosing it down if it tips over into the mud or sand. It goes without saying that it’s not submersible. Despite the full complement of buttons on top of the speaker, it still maintains an IP64 rating for protection from the elements. Soundcast says the battery pack, which you’ll need to install in a compartment on the bottom of the speaker, should take two to three hours to reach a full charge. You can then expect a robust 10 to 20 hours of playtime. I didn’t attempt to verify that claim, but I did conduct listening tests lasting several hours over a period of several days without running out of juice. If you want to take the VG7 tailgating, camping, or boating—locations where AC power isn’t available—Soundcast offers an optional 12-volt DC power adapter. 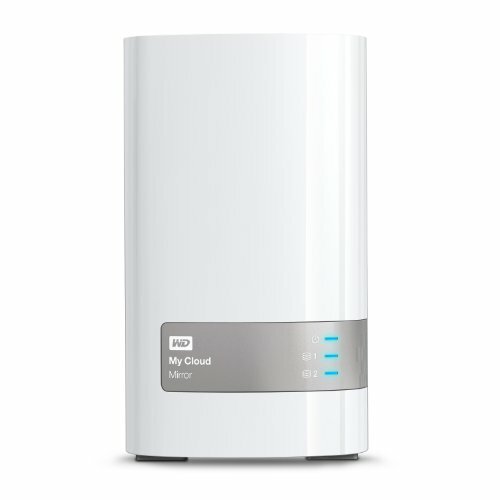 I streamed FLAC files and MP3s from the Tidal and Spotify music-streaming services respectively, as well as tracks ripped from CD, encoded in FLAC, and stored on a WD My Cloud Mirror running Plex Media Server. This is a Bluetooth speaker, remember, so the signal gets lossily compressed no matter what fidelity it’s encoded with. Having aptX support does help—and aptX HD (which the VG7 doesn’t offer) would help even more. Apple users will want to know that the speaker also supports AAC streams. The VG7 has a strong Bluetooth radio. I could wander just about everywhere in my 2,800-square-foot home without experiencing audio breakups or losing control over the speaker. The only location I did have a problem with was in my master bathroom, which is on the other side of my home theater. The home theater is a room-within-a-room with double-thick walls and insulation, so that wasn’t a big surprise. 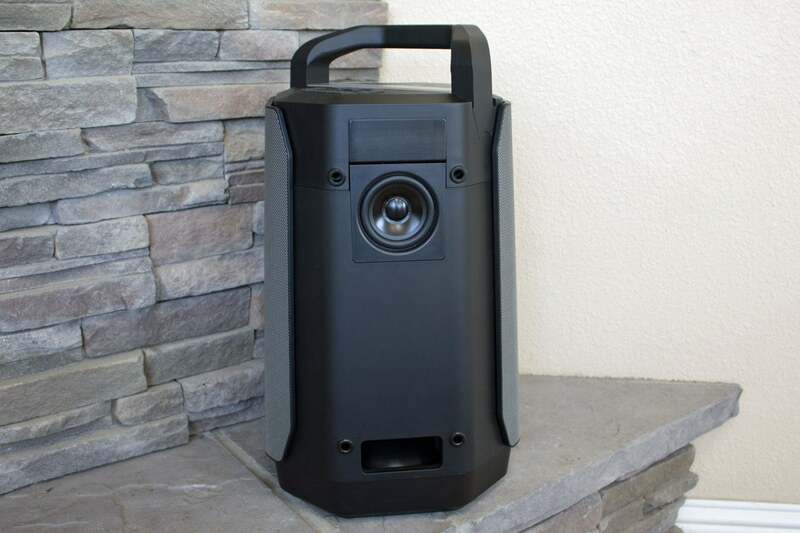 Outdoors, I could walk about 180 feet from the speaker, with no obstacles in between, and maintain control. You can charge your smarphone or tablet using the VG7’s USB port. There’s a 3.5mm analog audio input for other sources of music. The VG7 could fill any room in my home with sound. The same goes for my enclosed outdoor spaces, the front porch and the back patio. It’s somewhat less impressive in completely open spaces. Move more than 15 feet from the speaker, and the sound melts into background music that will get drowned out if lots of folks are talking—a PA system it ain’t. Place it in front of a wall—or better yet, a corner—where its sound can reflect off vertical surfaces, however, and you’ll easily gain another five feet of coverage. Your listening position also matters. If the speaker is on the ground, you’ll enjoy it best while seated. If you’re standing, I’d recommend putting it on a table or a low counter so that it’s not projecting sound at your knees instead of your ears. I streamed a number of very familiar tracks, including the Mark Knopfler/James Taylor duet “Sailing to Philadelphia,” from Knopfler’s album of the same name (streamed from Tidal). Knopfler’s guitar picking was rendered clearly and distinctly, while the singers’ mellifluous voices blended beautifully. Switching gears in a big way, I then queued up Betty Davis’ “Don’t Call Her No Tramp,” from the soul diva’s album They Say I’m Different.” I was impressed with VG7’s ability to present the interplay of the bass player’s funk fingerings and the percussionist’s intricate work on his kit without losing track of the organ or compromising Davis’ blistering vocals. In another 180, I then played “What Makes the Monkey Dance,” from San Francisco’s hometown favorite Chuck Prophet (ripped from his No Other Love CD and encoded in FLAC). This song is filled with all manner of acoustic delights, and VG7 rendered them with aplomb. Okay, 800 bones is a lot to drop on a speaker. Times two for true stereo? Yeah. 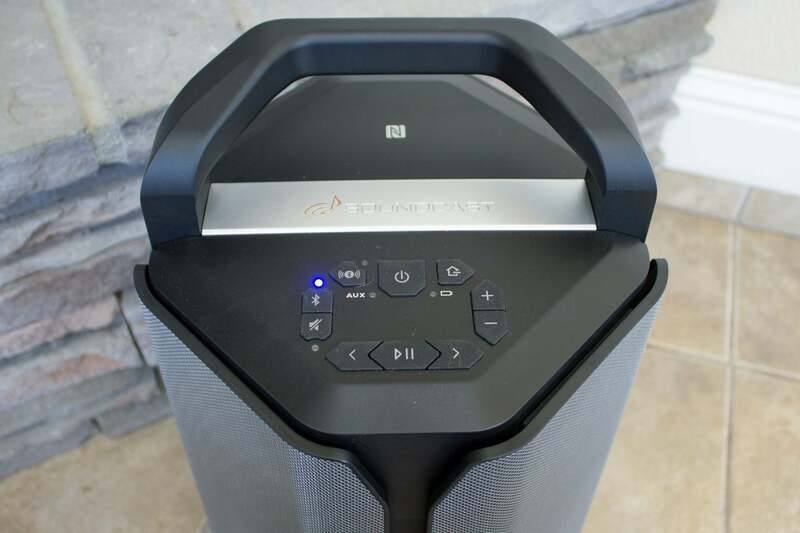 But remember what I said up top: I haven’t seen a better portable outdoor speaker come to market in the nearly 10 years since I reviewed Soundcast’s first portable outdoor speaker. The VG7 is simply splendid.